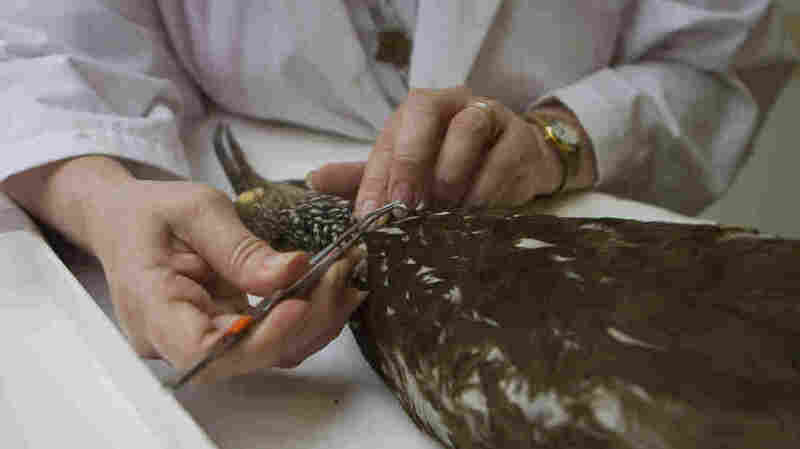 Animal CSI: Inside The Smithsonian's Feather Forensics Lab A keen eye and extensive knowledge of feathers allows forensic ornithologist Carla Dove (yes, that's her name) figure out from feather and bone fragments which type of bird crashed into a plane or was eaten by a snake. But the expertise has an uncertain future. Feather forensic expert Carla Dove makes a slide of a partially digested bird feather taken from the autopsy of a Burmese python in Florida's Everglades National Park. Park officials mailed the stomach contents of eight pythons to Dove's lab at the Smithsonian Museum of Natural History so she could identify the types of birds the pythons had eaten. 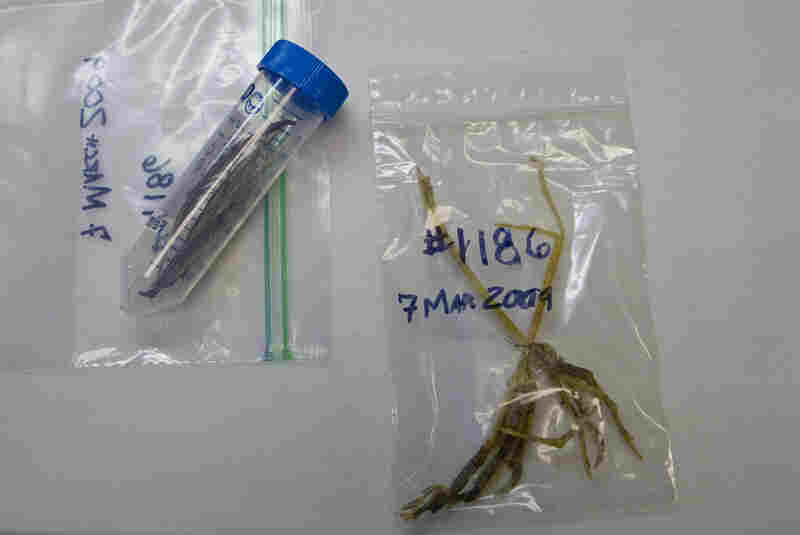 These partially digested specimens were cleaned, dried and labeled by the National Park Service in Florida and mailed to Dove's lab. The larger bag contains a python's ID number and is filled with smaller bags labeling each specimen. Dove has a good sense of the species she may be looking for. 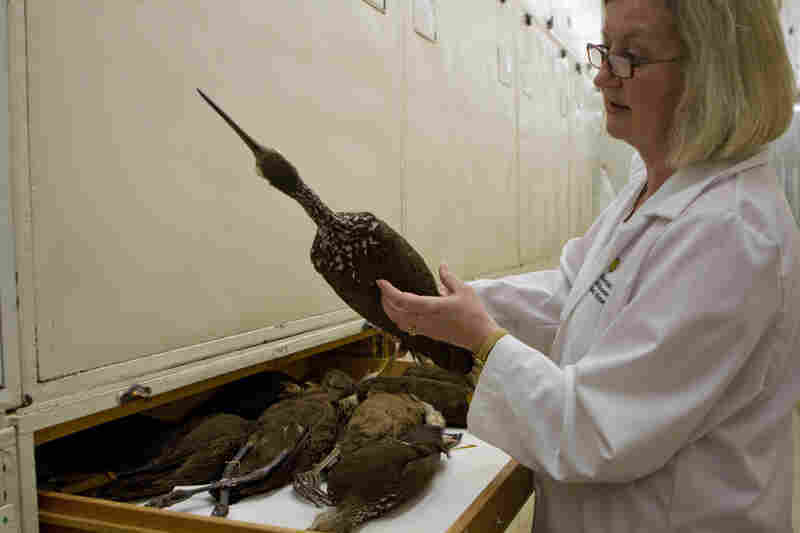 She pulls out a limpkin (a cranelike bird that lives in Florida) from one of the many drawers in the museum's bird collection to compare its feathers with her sample. 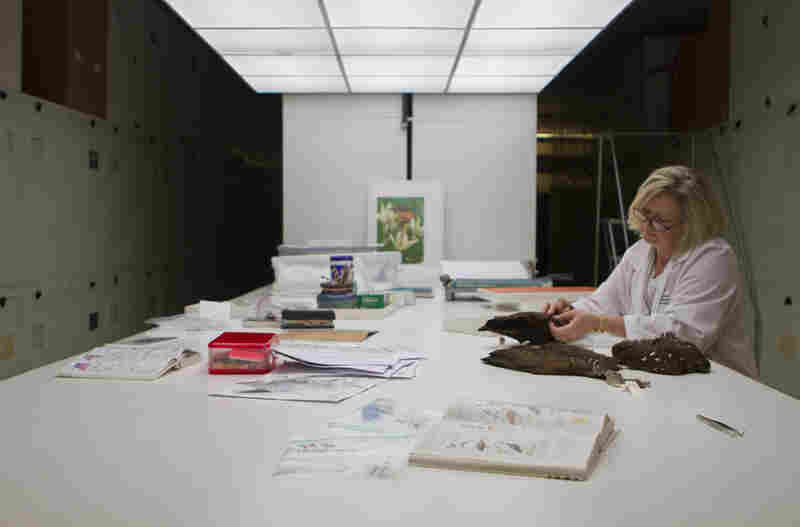 The ornithologist works through the feathers of the stuffed birds to find one that matches her sample. Carla Dove smiles as she tears open a small, flat cardboard box. 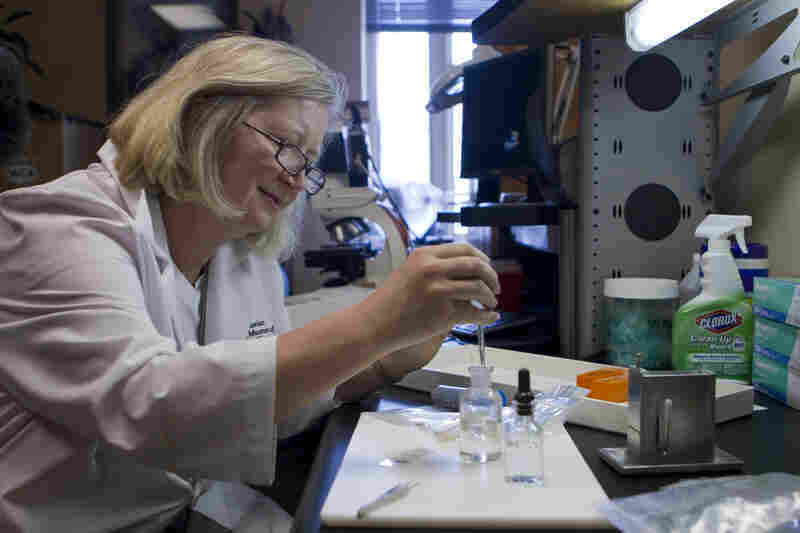 She is sitting at a lab bench in her office at the Smithsonian Museum of Natural History. "It's kind of like Christmas for me because I never know what's going to be in the packages," she says. Inside the box are a bunch of sealed sandwich-size bags. Dove counts the bags. "Eight samples today," she notes. Each sample consists of grayish pieces of feathers, and sometimes bones, all from inside the stomachs and intestines of Burmese pythons. Dove is an ornithologist and a forensic expert of sorts. But unlike most forensic scientists, who help identify perpetrators of crimes, Dove identifies victims. And the victims in this case are birds. From the skimpiest of remains — mere bone fragments and feathers — Dove often can trace the dead bird's species. The aviation industry relies on Dove to identify the birds involved in thousands of collisions between birds and planes every year. Recently, she was called in to solve a different sort of murder mystery — applying her skills to figuring out which types of native birds are falling prey to the giant Burmese pythons now thriving in Florida's Everglades. Park officials know the snakes are devouring rabbits, foxes, even alligators. They have sometimes caught the pythons in the act. In addition, scientists have documented declining populations of a range of mammals in the area, suggesting the big snakes may be slowly wiping them out. But less is known about which birds these pythons have been snacking on. So park officials recently approached Dove for help. She gets to work, picking up one of the plastic bags, labeled "Python no. 780. (Collected on) March 18th, 2013." "We can see what's in here and go to work and identify what birds this nasty python has been eating," says Dove. Identifying the birds from their DNA is nearly impossible in these cases because the half-digested remains are contaminated with snake DNA. Instead, Dove concentrates on subtle distinctions among feathers. "Sometimes they are nice and complete feathers and I can recognize them right away," says Dove. But often, she has only tiny fragments to go on. Like the one she pulls out from the bag with the help of tweezers. "Even though it's as tiny as a strand of hair really, it can be enough to have some special diagnostic microscopic features to help us determine if it's a heron or maybe it's a bird of prey or a pigeon or a dove," she explains. The piece she holds is a downy bit from the base of a feather. It contains tiny branches called barbules. Dove gently places it on a glass slide, and turns on her microscope. 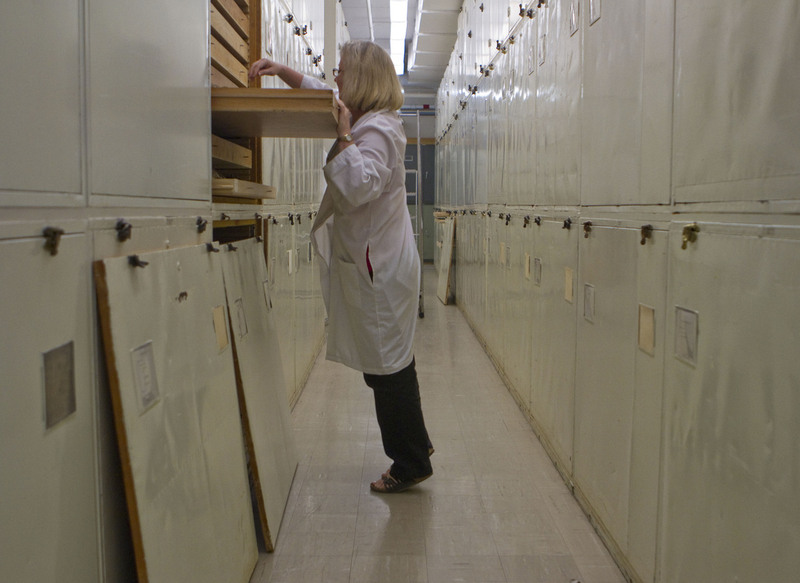 Dove relies heavily on the museum's massive collection of birds to solve her feathered mysteries. The collection contains about 620,000 species from all over the world. The birds are organized alphabetically in drawers that reach floor to ceiling. "I'll let you have a look at this," she says. "In the middle of the slide there's a tiny piece of a downy barbule that has me excited." All I see are a bunch of fine, transparent needles with bits of color here and there. But Dove recognizes the pattern instantly. It belongs to a group of birds that includes cranes and rails. This bird, though, is different from the other birds in that group, Dove says. She suspects the python's victim was a limpkin. The field of forensic ornithology had its start in 1960, when a flock of starlings brought a passenger plane down in Boston Harbor. The crash destroyed the plane and killed most of the people onboard. "After the Boston crash, that's when the airlines industry started to get really interested in birds that are causing damage to airplanes," says Dove. Most such strikes don't cause crashes, but it's still really important to know which species was involved, Dove says, so you can try to change the flight path, or alter the airport environment or design stronger aircraft engines. And there's a huge demand for Dove's expertise. Just this past year, she processed about 8,000 cases, many of them involving military airplanes. "We get a lot of samples from Afghanistan," Dove says. A few years ago, she solved the mystery of a large unknown bird that flew into a fighter jet at Bagram air base. "There was several million dollars' worth of damage," says Michael Begier, the national coordinator for the Airports Wildlife Hazards Program at the U.S. Department of Agriculture. He was called in by the Air Force to help with this case. Dove had identified the offending bird as a black kite. "The black kite is a raptor, but it's similar in size to some of the vulture species we have in North America," says Begier. It was up to Begier and his team to prevent such accidents from happening again. So they went out to Bagram air base and started looking for black kites. "One of the things we discovered is that trash disposal at the base was in a spot that brought the birds closer to the runway and the flight paths of the jets," he says. Once the trash was removed, the birds disappeared. Dove is able to identify birds from anywhere in the world, in part because the Smithsonian Museum has a massive collection of birds. She takes me out into a climate-controlled hallway, stacked from floor to ceiling with wooden cabinets. Unless I have someone to follow me around, and do some research on the microscopic structure of feathers, I think that one of these days the whole expertise in this field is going to go away. "This collection is like my library ... my reference," she says. The library has 620,000 specimens from around the planet. Dove's work with the military in Afghanistan alone has added 80 new species to the museum's collection. But it's the python victims that are on her mind today. She wants to confirm that the fragment she saw under the microscope was indeed from a limpkin, and she's in luck — in addition to the fragment, the plastic bag also contained a single intact feather. "Here we go to the limpkin drawer," says Dove, as she walks up to one of the cabinets. She slides off the door and pulls out one of the drawers. Inside are a bunch of very still, very dead birds that look something like a crane, all brown in color with lots of white specks. Dove holds the single feather from the sample against the wing feathers of one dead bird. The match is perfect. "I think we have solved this case!" she declares. "Python No. 780 was feasting on a limpkin on 18th of March, 2013." In all, Dove has examined the remains of nearly 150 Burmese pythons. She has found that they snack on some 30 species of birds, including limpkins, mallards, egrets, herons and wood storks. 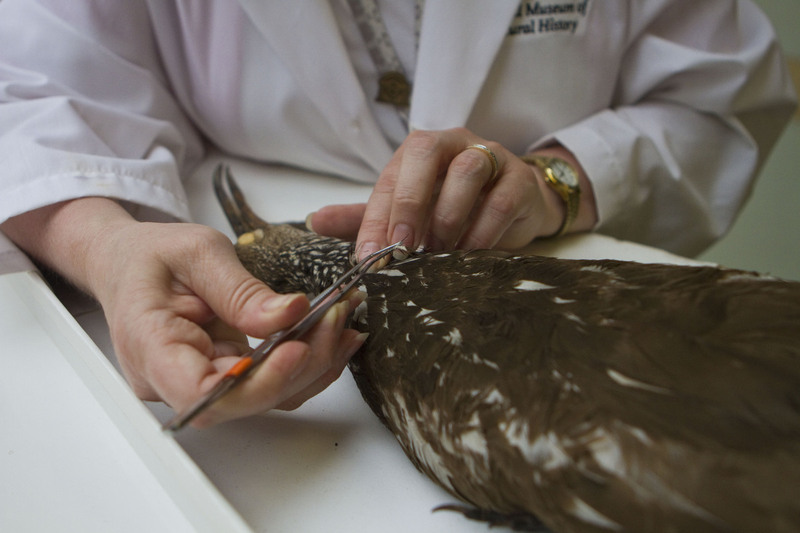 Dove matches a feather from one of the museum's limpkin specimens to a partially digested feather sample taken from a Burmese python. Dove's keen eye and knowledge of feathers have come from more than two decades of practice. She's the only person in the country with these skills, and she worries about the future of this kind of analysis. "Unless I have someone to follow me around, and do some research on the microscopic structure of feathers, I think that one of these days the whole expertise in this field is going to go away," she says. These days, she says, students are more interested in "instant satisfaction" and cutting-edge technology. Dove inherited her lab from the only other U.S. scientist to do this work: Laybourne, who was already in her 80s. Dove says she has yet to find the person who will take over when she retires — the special ornithologist who can continue the work in this unusual feather forensics lab.